THE samosa is arguably the most enduring of Indian snacks. It is staple fare in canteens and hostel messes and is ubiquitous on railway station platforms. The samosa, like a tikki, can be conveniently packed between two slices of bread or a split bun to create a filling sandwich. 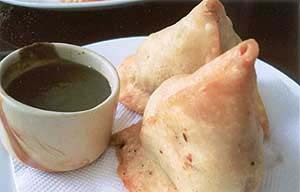 A friend insists that the samosa is the inspiration for the vilayati samosa– a patty. It is inevitably encountered in chaat shops across the land and there are some halwais who take greater pride in their samosa than anything else. Loknath in Allahabad has built an enviable reputation on the strength of its ghee ke samose dal ki pithi wale. These samosas have a fairly long shelf life. Boiled mashed potatoes and peas and spiced with powdered cummin, anardana, green chopped chilies or lightly sauted button mushrooms with mixed herbs or cooked minced meat mixed with chopped hard boiled eggs or assorted sprouts with carrot juliennes and diced string beans. Stir the flour with salt make a bay and pour the oil in it. Then, knead the dough reasonably hard adding a little water if required. Roll out in discs like a poori cut in halves. Lightly oil your palms and shape into a pouch by bringing the two sides of the crescent together. Place a little filling and seal the top after moistening the inner surface with water. Set aside and fry or bake in batches. Serve with chutney. In many small towns, the samosa-jalebi combo is what is synonymous with jalapana or kaleva- breakfast or tiffin on the go or a semi-formal celebration. Even the die-hard hypochondriac reaches for a samosa without any fear as the boiling oil has temperature that he believes destroys the hardiest microbes. Countless corner kiosks thrive on their daily sale to loyal patrons of their daily fix of this teatime delight. In Bengal it is called singhara perhaps due to their triangular shape recalling the water chestnut. And, then there are the mini cocktail samosas- dainty ‘lill’ things, the perfect finger food to tuck in before imbibing the fiery stuff. Samosas are basically savoury pastries stuffed with potatoes, peas, or minced meat. And, this is just for the starters. You are limited only by your fancy—mushrooms, chopped eggs and pickled olives, sprouts, cheese and what have you. It is quite common to enrich the samosa with dried fruits like raisins and nuts like the cashew. (There are sweet samosas too like the lavanglatika). Some health-conscious people are apprehensive about the deep-fried samosa but may we remind them that well-made samosas do not ooze oil. On the contrary, these are bone dry. If you are still scared, yield to the baked version of the sinful temptation. A samosa that is truly memorable does not have a thick crust but envelopes the fillings in a thin drape- one can even imagine that it is translucent. It is comparable to a perfect wanton, or dumpling. The casing can be pepped up by sprinkling the dough with ajwain or kalonji seeds. Amir Khusro, our own renaissance man, mentions samosa in his description of delicacies enjoyed by the princes and nobles in the Sultanate period 3th century. It was prepared, we are told, with meat, ghee, onions etc. This testimony is cited in support of the thesis that samosa is a foreign import. However, others quote chapter and verse from ancient Sanskrit texts to dispute this. There did exist a delicacy called samushak that is virtually indistinguishable from the familiar stuff.